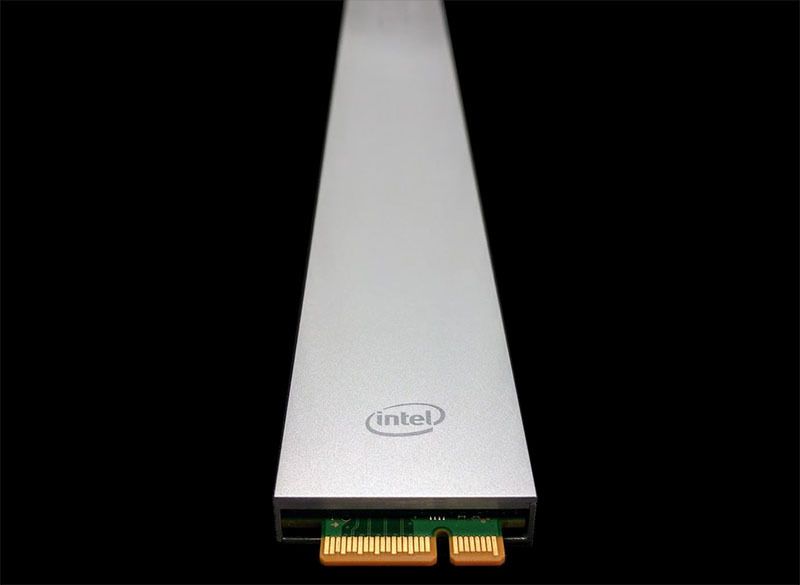 This week at Flash Memory Summit 2017, Intel announced the “Ruler” SSD. We had an opportunity to get some hands-on time at a small briefing with Intel at FMS 2017 in Santa Clara, California. 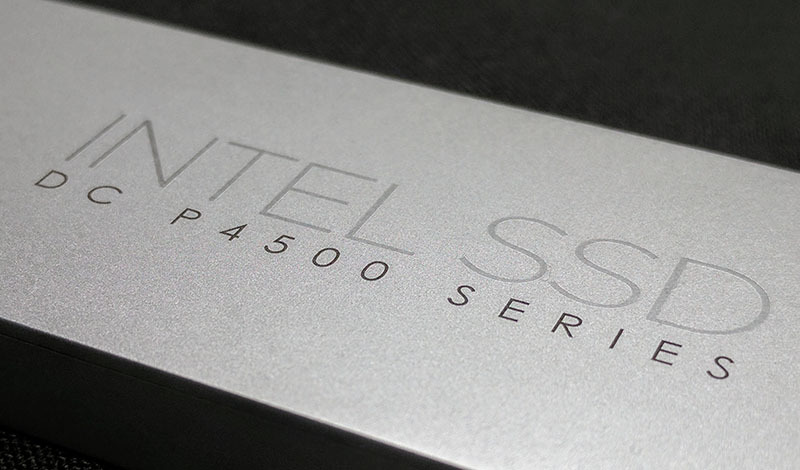 We do want to note that the Intel Ruler SSD is not a product that may ship in the future, instead it is a product that has been shipping to a major cloud deployment for many quarters. U.2 form factor SSDs and PCIe add-in cards have been the de-facto standards for enterprise deployments. M.2 SSDs are popular as well but they were designed for consumer (notebook) platforms rather than for data centers. A few months ago we covered the Samsung M.3 standard as a potential fix, but we expect two years from now the standard will be something more akin to the Ruler SSD. The Ruler SSD at this point is a NAND NVMe SSD in a different form factor. The idea is that by elongating the SSD along with building a casing, one can get highly serviceable and denser storage. 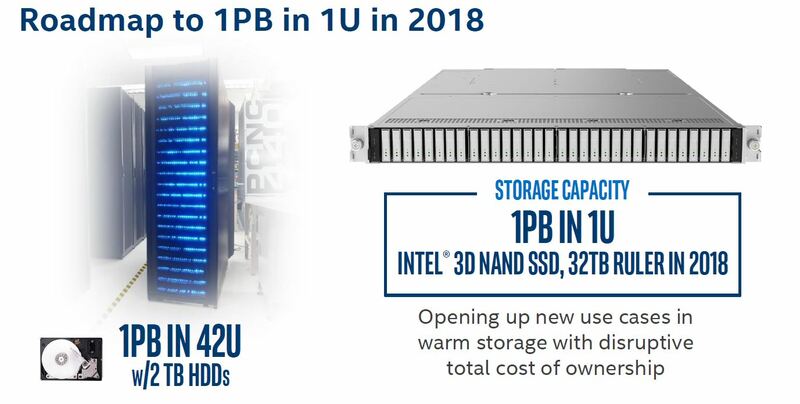 Intel is already talking about 1PB per U for JBOF systems. The Ruler SSD also has a latching mechanism and does not require a hot swap drive sled like U.2 SSDs. This servicing makes upgrades or swaps easier for data center operations teams. 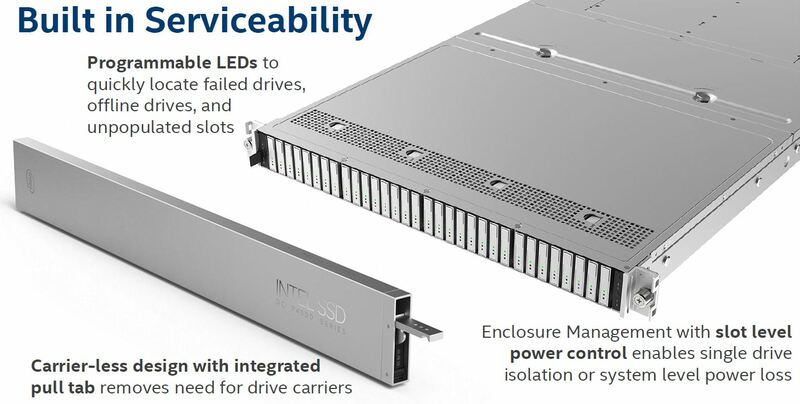 The edge connector is currently a PCIe 3.0 x4 connection, much like U.2, m.2, and most PCIe NVMe drives. 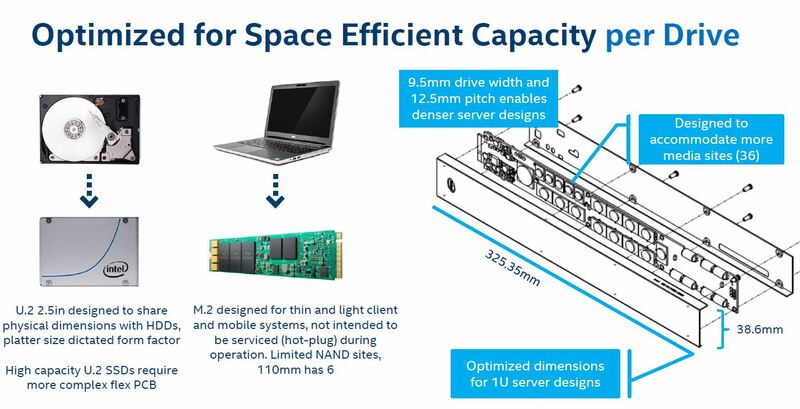 We were told that the PCIe connector has specs for x8 and x16 connectors and will be electrically viable even for future PCIe 5.0 speeds. Although Intel is “announcing” the ruler SSD at Flash Memory Summit 2017, it has already been selling. We have heard through the grapevine that Dell EMC had a major win at IBM SoftLayer using this technology. This is also not a new technology today, IBM has been buying the drives for several quarters. Looking beyond NVMe SSDs this is a needed form factor. The obvious candidates are Optane SSDs where getting better utilization in a JBOF form factor would be extraordinarily valuable. Less obvious, but perhaps more important, are with devices like FPGAs. 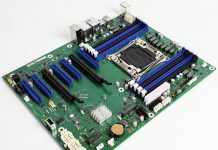 With the larger PCB area and up to x16 connectors, it is easy to see this form factor become adopted as a standard for other PCIe devices. It just so happens, with Altera, Intel has a FPGA business where it may one day want to have arrays of PCIe based FPGAs. Looking beyond Intel, we do not see the current ruler as the end spec. Instead, we see an industry consortium coming up with a similar design with different height (2U) width (double wide) and length options. While the future may look similar, this is where the industry needs to move beyond traditional PCIe add-in card slots. The future is hot pluggable and higher density. 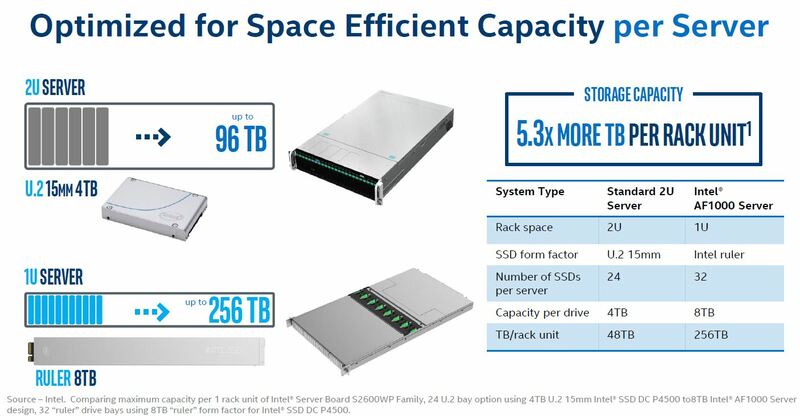 While I’m sure there’ll be some buyers for those SSD (like Facebook or Goldman Sachs etc) for most use cases it looks to me like a solution in search of a problem due to it’s very high cost (proprietary nature of those SSDs will probably translate into an EXTRA 100K$ or more per U for a 256TB version – i.e. 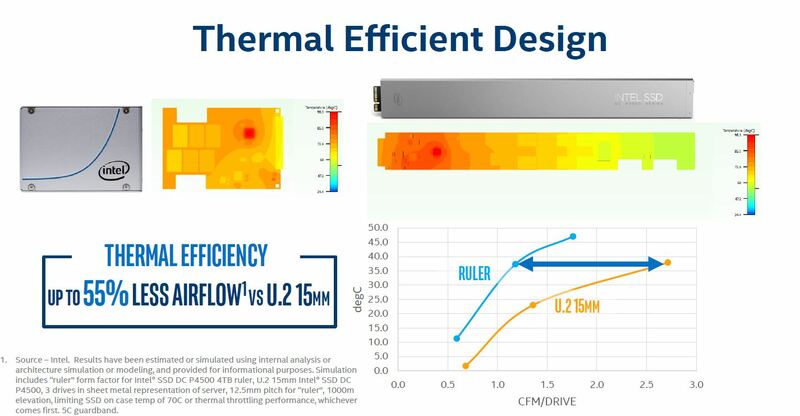 over 4M$/rack even at current density as well as an extra cost due to reduction of usable SSD life caused by higher average temperature) as well as extreme bandwidth required ( ~1Terabit/sec per U) if those are used in JBOF. I am just imagining the number of such drives that will be damaged due to impact on that exposed PCB at the end of such long metal bar. Not very wise design there IMHO. 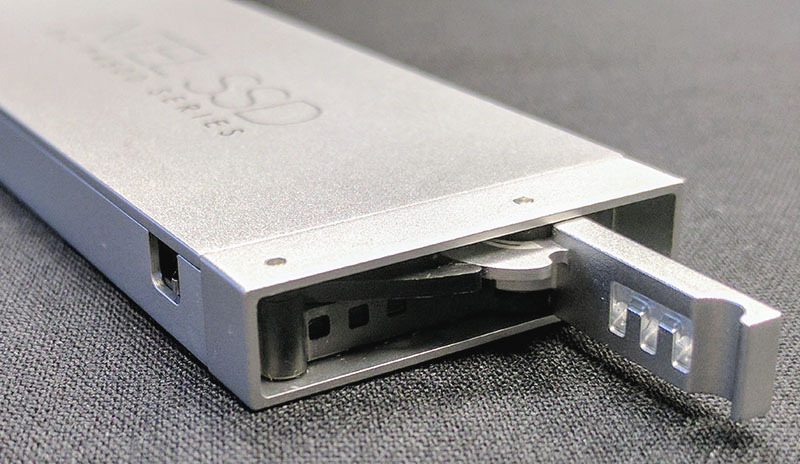 Otherwise, don’t know if this is end game or not but certainly SSDs now deserve a form factor designed specifically for them, and this is a very nice design.